Recognizes endogenous levels of HOXA11/D11 protein. KLH-conjugated synthetic peptide encompassing a sequence within the C-term region of human HOXA11/D11. The exact sequence is proprietary. Small volumes of anti-HOXA11 antibody vial(s) may occasionally become entrapped in the seal of the product vial during shipment and storage. If necessary, briefly centrifuge the vial on a tabletop centrifuge to dislodge any liquid in the container`s cap. Certain products may require to ship with dry ice and additional dry ice fee may apply. Western blot analysis of HOXA11/D11 expression in HEK293T (A), HeLa (B), K562 (C) whole cell lysates. 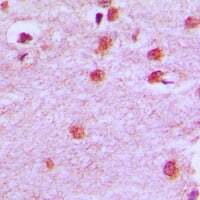 Immunohistochemical analysis of HOXA11/D11 staining in human brain formalin fixed paraffin embedded tissue section. The section was pre-treated using heat mediated antigen retrieval with sodium citrate buffer (pH 6.0). The section was then incubated with the antibody at room temperature and detected using an HRP conjugated compact polymer system. DAB was used as the chromogen. The section was then counterstained with haematoxylin and mounted with DPX. Immunofluorescent analysis of HOXA11/D11 staining in HeLa cells. Formalin-fixed cells were permeabilized with 0.1% Triton X-100 in TBS for 5-10 minutes and blocked with 3% BSA-PBS for 30 minutes at room temperature. Cells were probed with the primary antibody in 3% BSA-PBS and incubated overnight at 4 degree C in a humidified chamber. 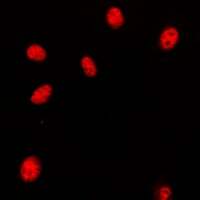 Cells were washed with PBST and incubated with a DyLight 594-conjugated secondary antibody (red) in PBS at room temperature in the dark. DAPI was used to stain the cell nuclei (blue). NCBI/Uniprot data below describe general gene information for HOXA11. It may not necessarily be applicable to this product. HOXA11: Sequence-specific transcription factor which is part of a developmental regulatory system that provides cells with specific positional identities on the anterior-posterior axis. Defects in HOXA11 are the cause of radioulnar synostosis with amegakaryocytic thrombocytopenia (RSAT). The syndrome consists of an unusual association of bone marrow failure and skeletal defects. Patients have the same skeletal defects, the proximal fusion of the radius and ulna, resulting in extremely limited pronation and supination of the forearm. Some patients have also symptomatic thrombocytopenia, with bruising and bleeding problems since birth, necessitating correction by bone marrow or umbilical-cord stem-cell transplantation. Belongs to the Abd-B homeobox family. 1. Study suggests that HOXA11 hypermethylation may contribute to the progression of NSCLC by promoting cell proliferation or migration.